New research from the Universities of Edinburgh and Sheffield has revealed some uncomfortable truths for those seeking to reduce inequality in the arts. Mark Taylor and Dave O’Brien’s new paper in the journal Sociological Research Online describes fresh analysis of data from nearly 2,500 people working in the fields of culture and the creative industries. They found that those employed in the sector believe hard work, knowing the right people, ambition and talent were what it took to succeed. Those at the top of the sector (the best paid) seem to believe race, class and gender are not limiting factors, whereas those at the bottom are most aware of the structural inequalities that hold many talented and ambitious people back. 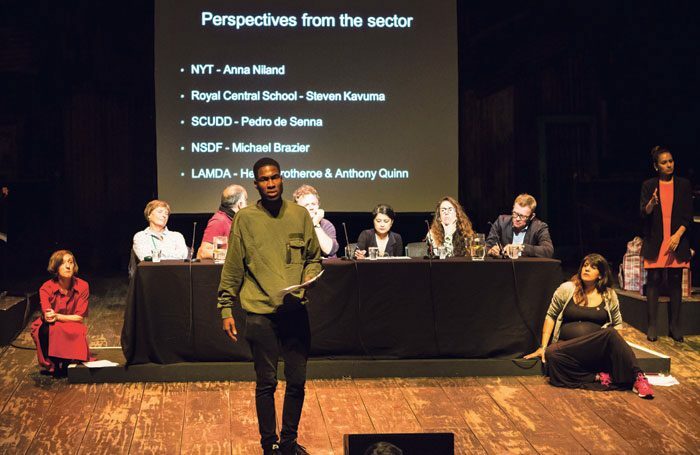 It has long been recognised that structural barriers mean that the cultural and creative industries are not meritocratic, and this new research suggests that those in the arts remain wilfully ignorant of the forces that shape their unequal sector. Taylor and O’Brien were interested in the values and attitudes held by people working in the sector, and asked respondents to select which factors have affected their ability to ‘get into’ and ‘get on in’ their careers. This includes factors such as hard work, having educated parents, talent, ethnicity, class, religion and gender. Not everyone likes to think these things matter. Every few months, a new report reveals some dismal statistics about inequalities and under-representation in the arts along lines of gender, race, class and disability. Government surveys on cultural engagement consistently show how audiences are disproportionately well educated and well off. Arts Council England data from its funded organisations describes a workforce that is predominantly able-bodied and dominated by white men at the executive level, something that’s further reinforced by ONS data about the sector more widely. Figures released by the BBC earlier this year revealed substantial discrepancies in top-level pay between men and women. Last week’s analysis of British film by the BFI showed how cinema’s gender imbalance is worse in 2017 than it was in 1913. And data from the controversial Project Diamond is likely to substantiate long-held suspicions about under-representation of many demographic groups on the small screen. It has been possible in the past to hide behind the ambiguities around workforce statistics in the culture and creative industries. National data sets don’t always distinguish between distant parts of this somewhat miscellaneous category: programmers get lumped together with poets. When people make bold claims about the economic value of the creative industries, they’re usually referring to the former; when they talk about precariousness and poverty, they tend to mean the latter. All this evidence has prompted a concerted effort from various quarters to address inequality and a lack of representation. Act for Change, Arts Emergency, MeWe360 and many similar organisations are working hard to turn the tide and are making real differences to people’s lives. In a competitive jobs market, “stories like the BBC pay scandal perfectly illustrate how the ‘cake’ is divided at the expense of female, black and working-class colleagues”, says Kevin Osborne from MeWe360. It’s easy to see how the cultural workforce becomes over-populated with the titled and entitled. Connections made through family, education and community lead to unpaid internships, which are followed by intermittent and exhausting work for low pay. This doesn’t necessarily create an impoverished workforce, but means instead the labour market is best navigated by those with the means to self-subsidise, usually thanks to the bank of mum and dad. Eventually these people settle into a secure and salaried position, by which time – Taylor and O’Brien’s data suggests – they forget the tailwinds of privilege that propelled them along their journey. That privilege is insidious, even if it’s not deployed intentionally. Taylor and O’Brien’s findings also have a counter-intuitive political angle. People working in the cultural and creative industries tend to be more left-wing and liberal than the general population. In theory, such progressives might be expected to think more critically about the social structures that privilege some and hold back others. The romantic vision of the struggling artist slaving away for pennies is a difficult cliche to dislodge. In the age of the cosmopolitan creative class, this has been updated to encompass politically liberal young creative entrepreneurs with nothing but a lack of imagination and hours in the day to hold them back. But this matters. Whether you’re picturing Rodolfo, Withnail or Hannah Horvath, government policy around education, housing, tax and benefits is framed as much by policymaker’s in-built expectations and values as it is by evidence and expertise. Taylor and O’Brien show that the culture and creative industries workforce is as wedded as everyone else to the idea that they operate in a meritocracy: “Almost everyone believes that hard work, talent and ambition are essential to getting ahead, while class, gender, ethnicity and coming from a wealthy family are not. What hope is there for sectoral change if the workforce is incapable of accepting the real structural forces that result in the inequity that’s apparent to all? It seems that good intentions from politicians and advocates will only go so far without confronting some uncomfortable and inconvenient truths.